In case you haven’t heard, I have a new article site going, called Marcana.com. Well, it’s not exactly new, but the barrage of daily articles and most of the fantastic new authors in this new incarnation certainly are. I’m talking about people like Will Reichard, JC Hewitt, Justin McCullough and others yet to have made their debut. You’re going to like Marcana.com for social media articles, marketing articles, strategy guides, startup advice and a heck of a lot more, besides. You should really subscribe now, so you can say you were hip when hip wasn’t cool, or whatever people say at such times. Follow @MarcanaGuides for the latest updates sent right to your hot little hands. Hurry on over. I posted a special how-to article there on Google Analytics today, and you know you’ll want it while it’s good and fresh! Thanks to everyone who has supported this blog. I will continue to post my more personal reflections on social media, marketing and what have you here, but please plugin to Marcana.com for the bulk of my marketing how-to’s, strategy pieces and reviews, not to mention a whole bonanza of other great articles by an entourage of superb topic experts I’ve thankfully bumped into along the way. This blog is not going fallow, it just got too cramped to house this (very recent) flurry of ideas and ambitions, so now it has the help that it deserves. As they say in the Chengdu dialect…gumbei! 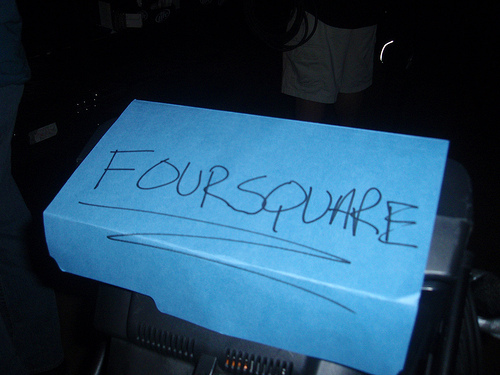 The FourSquare "Game": This year's model in barhaopping, and not much else? There is a great piece (great as in hilarious) that vents on FourSquare making the rounds today. The argument is not a new one, but ages well over time. It runs along the lines of “we’re sick of seeing your pointless FourSquare updates” and extols the virtues of real-life connections over virtual ones. In part, I think this is dead-on, and in another sense I think the ennui of virtual connections has mostly to do with their inherent shallowness of purpose to begin with. A lot of the shallow/surface short-term limits of social media tools like FourSquare are about context and can easily be overcome with some longterm branding vision. Say you’re a location-hopping fool and just too social to know what to do with yourself. FourSquare’s “check-in” game makes sense if you are checking in for the sake of connecting with just the people you know well. It becomes a surreal, futuristic Arnold Schwarzenegger movie when all the personal elements of one’s day are turned into a voyeuristic game for anonymous onlookers to engage in from a window. Afterall, do you really want everyone to know what you’re doing 24-7? Are there really no negative repercussions to checking in everywhere you go? In fact, we all know there are. FourSquare may be banking a little too much on the “game” lifecycle of its own service. With social media comes more opportunities to socialize and make new connections. Networking for business benefits from social media and so do tribes with common interests. When it comes to forward-looking insights on how social media does and doesn’t make sense, FourSquare looks a little like another 5-year company to me (being generous here), unless they can seriously come up with new ways to market their service to young professionals and entrepreneurs and innovative company management. For instance, checking in makes sense to your boss if you’re on company time and he’d like his team to spread out, get things done and stay plugged-in with each other. Same holds for family and friends. As a gamy fad, however, it’s not a business proposition so much as a bet on how long a fad can be stretched before it implodes and fades away under the fierce cacophony of public derision that once also embraced MySpace as an open-ended social media tool. [tweetmeme source=”MarkBrimm”] If you already know everything there is to know about social media, then please move along. …Still here? Great! Me, too! While I don’t claim to be a foremost authority on social media (or much of anything else, I’ve decided in later life), I’ve learned a thing or two while learning that fact: pay attention, watch, read, learn. This small list is not a “new books” list by any means, it’s a “you should have already probably read these” list for people newer to social media or who, like me, may not feel comfortable in casting aside the classic standards of the social media resource genre just because their time is valuable. Some of these authors do not entirely agree, which sis actually valuable in that you get some not-quite in-sinc takes on some social networking issues. Twitter and Facebook are shaped as much by a noteworthy book as they are by its readers, admirers and practitioners of any insights they hold. And this one has lots of insight, as well as kudos from the social media community. Brogan and New Labs Marketing continue to be a driving force in demonstrating community and the principle of “trust” for social media marketing and networking. There is a good reason this book is first. Where it may not be a how-to in some respects, it is an absolute eye-opener about what the authors and a few others have long ago realized about the importance and nature of trust and transparency in social networking and social media marketing. For this reason, I would seriously recommend starting here, only because it’s the most insightful reading of key issues in social media and social networking at large. Seth Godin is a prolific writer of books on what could be called “social media theory” and while I don’t own (and haven’t read) most of his other books, this one inspired the world to get on social networks and use them for things they really care about. If you want to understand the “twibes” phenomenon, or the possibilities of social media, you should start here. As some have pointed out, the book is short of documentation, and long on examples (remember “Dancing Matt” on YouTube? ), but it is intended to show corporate decision-makers why social media is important to their brands today, and that it does brilliantly. While not a handbook on “how-to” for what it sets out to do, it certainly succeeds. It is a starter course, along with the previous two books on our list here, on why your company should consider going social with a brand. Low-budget marketing forces one to become smarter than the big guys. This is the unlikely advantage of having little or no venture capital in the hands of a survivor. Inbound Marketing shows how to apply the older branding principles of Al Ries and company to new levels in the age of social networking where PR can be a matter of viral phenomenon hits and misses. Gary Vaynerchuk is a marketing coach on steroids, with energy and drive that most us will never quite have. That’s his drive, to find a better way, to see deep into what the problem is quickly and put a solution into the fray. As Gary cogently explains, advertising dollars are what’s ultimately at stake for a blogger with a keen eye or a topic expert with a visionary outlook. And best of all, Gary practically tells you how to do it by giving you sample strategies that can inspire you to find your own model. Not to be missed.